I’m up and writing at a pretty silly time on New Year’s Day. Why? Because this year I’ve set myself a big running target and I want to start as I mean to go on. My local parkrun has its New Year’s Day run at 9 o’clock, and I can think of no better way to get me into the good habits I need than of joining the other people on the start line and plodding my way round the 5km in the mud. The target is, in many ways, just as much about my history as about my future. It’s about revisiting a classic run that I completed twice (having failed once) when I was a student in Lampeter. The Sarn Helen is a 16.5 mile mixed terrain race, with plenty of hills, which happens in mid-May. The race takes its name from the Roman road, and the historical course includes not just part of that road but also an Iron Age hillfort For my fellow student runners back in the mid-1980s, it was seen as the big one, the race that would give us some real credibility. I tried it in the first year of my PhD, and crashed out after only 12 miles. I cracked it the following year, and repeated it once more before left the area. This year, my friend Stephen, who also did it once and who I used to train with, has suggested that we go back. I’ll be 50 by then, he’ll have just turned 47, and, from this point on New Year’s Day, it seems like a great idea. Watch this space. I always think a lot when I run, and this seems like a great time to reflect on the more recent past of the year that has just ended. Professionally, it’s been a good one for me. The highlight was taking up my new post as Director of the International Centre for Sports History and Culture at De Montfort in September. It’s great to be working in such a dynamic environment alongside other sports historians, and now that I’ve got to grips with the job I’m looking forward to being involved in various projects that help to promote research into the history of sport. The taught courses that I’m involved with, from undergraduate to taught masters and the CIES International Masters, and the PhD projects that I’m working on, are also giving me plenty of opportunities to reflect on the relevance of the history of sport, and on how we approach it. 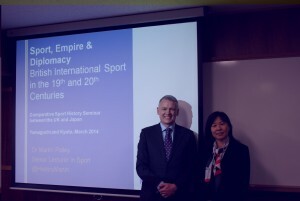 Another highlight was my trip to Japan in March, where I gave the keynote paper at the Comparative Sport History Seminar between the UK and Japan, at Ryukoju University (Omiya Campus) in Kyoto. I also gave a talk at Yamaguchi University, where my host, Dr Keiko Ikeda, was teaching. It was an unforgettable experience, full of new sights and new foods, and a range of experiences. As well as meeting some wonderful Japanese colleagues with a passion for sports history, I made my karaoke debut with I Fought the Law, woke up at 2am in my 8th floor hotel room to realise I was in an earthquake, and treated myself to a 7 mile aimless wander around Kyoto. I also visited one of the key sites in twentieth century history when Keiko took me to Hiroshima. I found the overarching narrative of victim-hood without context in the Peace Memorial Museum to be problematic, but some of the artefacts, the memorials, and the overall atmosphere were beyond moving. And then, of course, there has been Brentford FC, who made their own history in 2014. I’ve been supporting them since 1977, and this year saw them gain promotion to English football’s second tier (currently called the Championship) for only the second time in my life. Last time, in 1992-93, they went straight back down, and the hope amongst all fans this time was that we could do enough to avoid that. As I write on New Year’s Day, they are 6th in the league, and serious play-off contenders. This is their highest position not just in my 35 years of following them, but in my 50 year life. So, as I re-engage with my own history on the hills of West Wales, I’m hoping for the club to re-write their own history and make it back to the top tier which they last played in in the first season after the Second World War. So, as I pull on my trainers and head to the park, here’s a happy new year to you all, and all good wishes for 2015. I’m looking forward to developing as a historian, to writing and teaching,and to running into the future as a way of thinking about the past.